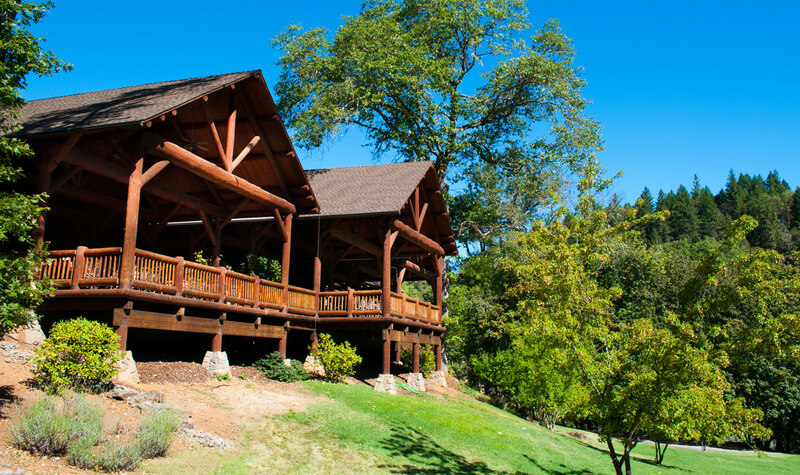 Hop on a jet boat ride to your own wilderness retreat. 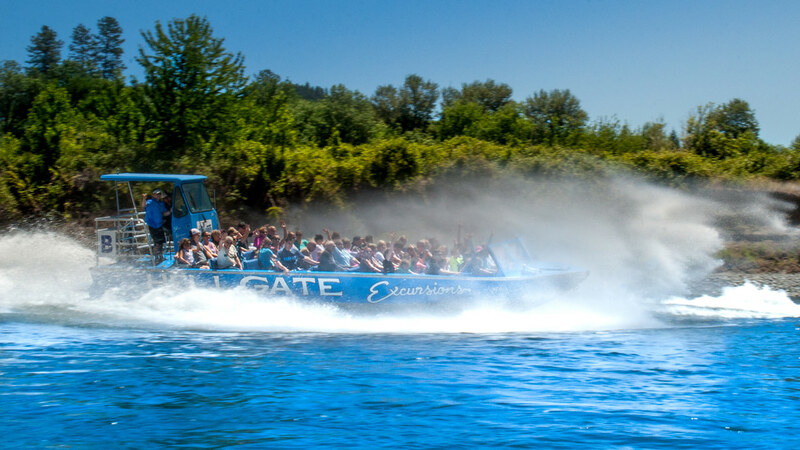 Discover the best of the Pacific Northwest on a Hellgate Jetboat Excursion — where you don’t just take a vacation, you experience the adventure! We glided along the surface of the Rogue River at an exhilarating speed, miles into the Wild and Scenic section of the river, blissfully isolated from civilization. Yet soon we found ourselves eye-to-eye with a barbecue dinner and a secret riverfront lodge, open only to lucky guests who land here via river excursion. 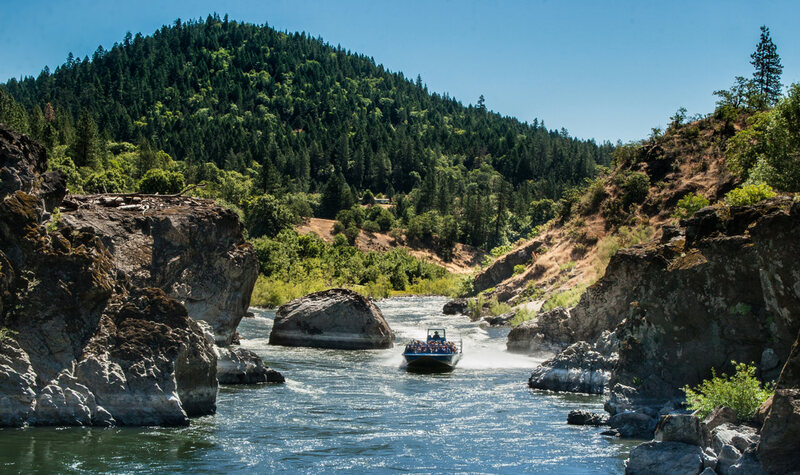 Family-owned businesses Hellgate Jetboat Excursions and the exclusive Hellgate River Lodge have been leading trips like this since 1959 — a jet boat ride on the Rogue with the option to stop over at their scenic day lodge. Visitors to Southern Oregon come for both the journey and the destination: It’s an adrenaline rush to get here, but once you’ve landed, it’s all about you, the pristine wilderness and your comrades from the boat to enjoy it all. Need more reasons to make this breathtaking journey, just an hour northwest of Ashland? We have six. The Rogue is steeped in history. On the trips I’ve experienced, we learned about the storied Western history of the area — from the first river explorers to the native tribes who called the Rogue home. They sprinkled in lessons about the geology of area, such as the visible flood marks along river’s the rocky cliffside. Within the canyon, visitors speed past the restored 1926 mining cabin built by iconic Western novelist Zane Grey, which is listed on the National Register of Historic Places and open to the public (not part of the Hellgate tour) via 5-mile trek in. The cabin’s remoteness and romantic allure inspired two of Grey’s most well-known books — “Tales of Freshwater Fishing” and “Rogue River Feud” — which are said to have put the Rogue River on the map for other pioneering adventurers.A few decades later, in 1959, Hellgate Jetboats became one of the first jet boat companies to operate in the United States, and they’ve continued to support the community around them. Their custom aluminum boats are built exclusively by Katanacraft, also based in the heart of Grants Pass. The Rogue River was one of the first eight of Oregon’s 58 prized waterways to be named under the National Wild and Scenic River Act, which marks its 50th anniversary in 2018. That’s more Wild and Scenic rivers than any other state, a badge of honor Oregon wears proudly. The Rogue flows from Mount Mazama, just north of Crater Lake in the Cascade Range, south and west through Grants Pass to meet the Pacific Ocean at Gold Beach, 250 miles later. Visitors love to play in and around the Rogue and its forests, trails, parks and campgrounds as well as on the water. It’s never been a better time to show support for the pristine waters and vibrant wildlife we all help to protect. Hellgate Jetboats actively works to enhance the scenic beauty through regular river cleanups. Watch for other Wild and Scenic anniversary events happening in 2018 throughout Southern Oregon and the rest of the state. My family and I have enjoyed two excursions with Hellgate Jetboat Excursions: their scenic two-hour, 36-mile trip that skims over the surface of the Rogue through historic Hellgate Canyon, and the four-hour round trip that also stops at the private lodge for a tasty barbecue dinner. In addition, they offer a brunch trip, complete with champagne, and a lunch offering, which is slightly shorter than the dinner trip. 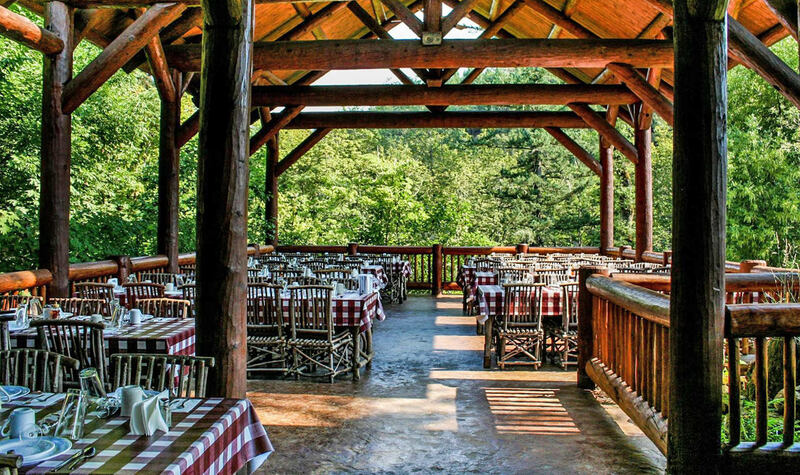 All the trips with meals stop at the Hellgate River Lodge, where you can hang out on the decks overlooking the river and sit at communal picnic tables that encourage conversation and lingering. If you want even more action, the five-hour, 75-mile whitewater trip includes a stop at Morrison’s Rogue River lodge on the route back. 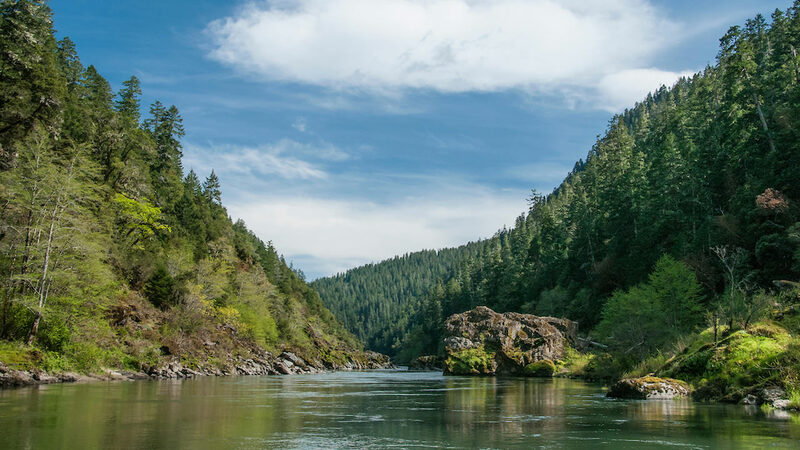 In case you don’t want to take my word for it, The New York Times recently included the Rogue River in a 2018 roundup of 52 Places to Visit, particularly noting its accessibility to adventurers. 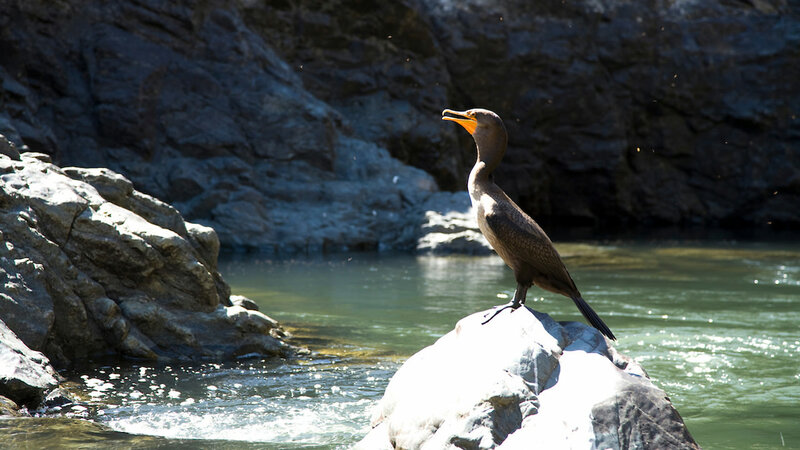 The Rogue canyon is famous for its challenging whitewater sections; world-class chinook, coho and steelhead fishing; rocky forested slopes; cascading waterfalls; and abundance of wildlife, such as black bears, deer, otters, great blue herons and osprey. Being on the water is perhaps the best way to experience it all. But while you’re in town, you can also choose a section of the 40-mile Rogue River Trail to hike, find your favorite way to explore the Rogue River-Siskiyou National Forest, and get to know Grants Pass on a family-friendly road trip. The first time I spied Hellgate River Lodge from the deck of my jet boat, I thought, how can I miss the boat back and simply stay here? Set right up against the water, the wooden lodge is truly unique in its solitary setting. You’ll want to hang out on the wide, sunlit deck overlooking the river, where you’ll be served family-style while seated at long, communal picnic tables. Linger over their meal until the jet boat beckons again (plan on being off the water approximately an hour and a half). Dining here with friends or family, you truly feel a world apart (you’ll have to save those Instagram photos for after your return). When you go: Hellgate’s season runs from May through September. Remember that early in the season, the water in the river is chilly; pack extra layers or rain gear accordingly. Toward the end of the season, trips are offered if the river water level is not yet too low, so call before booking. Whitewater trips are suitable for children ages 5 and up. Amy Whitley is an outdoors and family travel writer making her home in Southern Oregon. An avid backpacker, skier, and hiker, Amy has written features celebrating Oregon travel experiences from yurt camping to hut-to-hut skiing for local and national publications. Passionate about families getting outdoors together, Amy authors the NWKids column in OutdoorsNW Magazine, and spends her free time trying to keep up with her three school-aged sons in the backcountry. 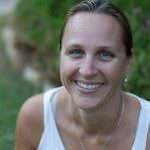 A lover of travel across the US and internationally, Amy is an editor at Trekaroo, and founder of Pit Stops for Kids.